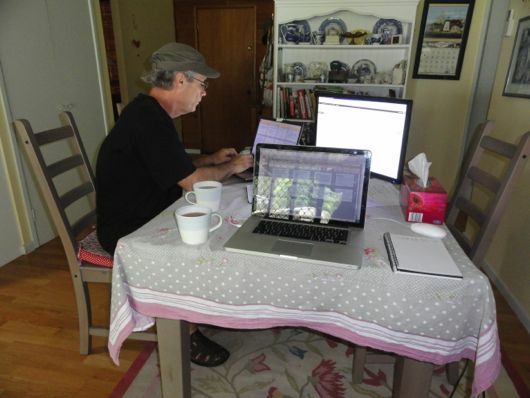 I will start writing my next book in July. It will continue the simple life theme but look at it from a different angle. So one of the things I'm doing again is to forensically examine the importance of organisation and routines in the home and what impact convenience has on our lives when we have to pay for it. I'm not against convenience or progress but I know first hand how much you have to pay if you buy it and when you're trying to live a more modest and frugal life, for me the price of convenience when I can make it, wash it or mend it myself, is just too high. It also makes sense in other ways too. I want to maintain my homemaking, cooking and traditional skills, and what I make here is healthier and fresher than anything I can buy. It's really a no brainer - as long as I can organise the time. Almost all of us have bought a pizza for dinner instead of making a meal from scratch when we're tired and short of time. I've bought seedlings instead of seeds for the sake of convenience too. Just recently when I was short of time and I had visitors coming, I bought a date loaf from the local baker. But I would never buy sliced apples in a bag, washed salad, or shredded cheese. That's going too far for me. I'm sure you have your own particular items you just won't compromise on and those that don't seem such a big deal. Just to illustrate the price of convenience when it's applied to food: ready to use, washed Asian greens are $5 for 350 grams. However, a bunch of baby pak choi (3) is $1.96, baby wombok is $2.98 = $4.94 and you'd have enough for at least two meals. So in that instance, it's double the price. Or 1 kg of coleslaw already made is $10 - but a ½ cabbage is $2.49, two carrots about 40 cents, an onion 30 cents and some homemade dressing about 50 cents = $3.69, a saving of $6.31 on one item. These are Woolworth's prices. Ernie, during one of work sessions last week. 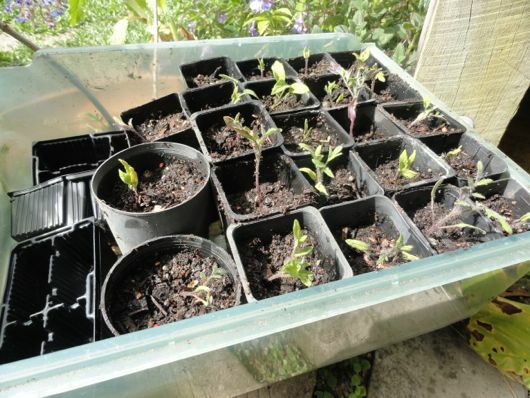 I know that if I was better organised than I am now, I would have been able to make my own date loaf and sown seeds to grow into seedlings here. It really does come down to organising the time you have to fit in what you have to do and what you want to do. I'm having a really busy time here at the moment. I'm getting ready for the writing and blogging workshops, writing material for simple living workshops coming up in July, trying to finish off the cheese and dairy book (it's nearly there), make up an ebook version of Down to Earth for the north American market, write my blog and visit the forum as much as I can. I do that as well as my house work, which is an important part of my life, I hope to get into the garden more as the season progresses and, last but never least, my family - I want to spend time with them or at least talk on the phone whether they're close or far away. I'm getting back into my heavy work routine again now and I hope it helps me do all the things I want and need to do. I also have Hanno's help. He volunteers to do a lot of things when he knows they need to be done. He's happy to do the washing, vacuum the floor, shop for groceries and (occasionally) wash up. He's my main support and back up because I know if I ask him to do anything, he'll do it. I'm still getting up early and it's then I do my blog and read emails. By 9am I have to have breakfast finished, the kitchen tidy, bread on and the bed made. Then I write. When I need a break I generally have a tea break around 10am, then I check the bread and get dinner organised. If it's something that requires long slow cooking I start it, if not, I'll get the supplies out if they're frozen, if it's all fresh I'll leave it till the afternoon. Lunch around 12 ish, when I have a real break - lunch and knitting. After lunch I write again and when I have my afternoon break it will be to do something like gardening, baking or cleaning. I'll do whatever I can fit into 30 minutes, no more. It's important to not go over my self-imposed time limits. If I stick to that routine, I'll be able to do my housework, writing and make all the things I currently make. I never want to get to the stage of paying someone to wash my lettuce or make my soap and biscuits and I know that if I am organised, have clear goals and stick to my routine, I'll be fine. But it's not easy. I also know that nothing is perfect and if there are days when I don't do what I'd planned, that the world won't end and I'll probably do it the following day, or the next. My routine rules are: have set time frames, don't go over them, write down what I have to do each morning, take breaks and look after me as well. Routines and organisation are such an important part of any homemaker's day, including those who work in the home full-time, those who do paid work part-time at home and those who go out to work and house keep before and after work and on weekends. How do you organise your days? I live in North Carolina and ordered my hard copy of Down to Earth through a site called fishpond.com/au. The cost of shipping was totally worth the expense...more expensive than if it had been able to be shipped from the US, but so worth it. I love having my own hard copy. It is beautiful. The cover, pages, photos, etc. are absolutely wonderful, not to mention the text written by Rhonda just the way she speaks in her blog. I'd spend the extra money on shipping if I were you so that you can have your own hard copy. I know you won't be disappointed. I just want you to know that I also ordered Rhonda's book at Fishpond and I received in in a very good shape. (Ok.. better late than never.. I had to be very, very patient.. ;o) And as Diane is telling you: it is só worth it! Hi Sarah. The dairy book and the north american down to earth will be ebooks. My agent is in New York and she tells me there is a market for an ebook version of down to earth there. The problem is I've only got an Australian publisher and overseas publishers haven't been interested. Quite a few of the international readers have ordered their books in Australia and had them shipped over. I hope that works for you too. I prefer paper books too. Take care love. I ordered Rhonda's book through Fishpond also and was very happy with the service and the arrival time. (USA). In fact I ordered two. One for me and one I gave to the local library so others, who may not be able to afford the book, could also read it. I will do the same with the next book. I don't do e-readers as nothing can compare to the weight and feel of a book in your hand. Also, I work on computers all day long and enjoy not having to stare at a screen when reading for pleasure. That's great news that you are writing another book - I am sure everyone will be anticipating its arrival! Your Routine Rules, while general, are specific enough to adapt to ANY household. Basically, they are what I aim for. I'm a BIG list-maker. The days I slack on this are the days I disappoint myself! I am also starting to see that these self-imposed time limits are a much better way to go. I tend to treat myself like a machine sometimes. It's all a learning process! Well, I've had to outsource my cleaning. I'm working as a teacher and I have an exploding business as a thermomix consultant so I'm out of the house at the moment more than I'm in it. It feels weird to pay someone else to do the cleaning, but honestly... something had to give. And it'll all be worth it next year when I'm debt free with no mortgage. If I didn't have routines that the boys and I adhere to ... most of the time.... the house just wouldn't be able to run effectively. With 5 people with busy timetables coming and going, things like dishes, laundry and baking have to be taken care of in a timely way otherwise everything would fall in a heap..
Hi froggie, it's wonderful to know you'll have that mortgage paid off next year. And now that I am retired....I want work to be enjoyable. If I have been working out in the garden for a couple of hours and suddenly I get the feeling of. "This is not fun any more", then it is time to stop. Stellamarina, that is how I operate too! Thank you Rhonda, just the post I needed. My littlest started school this year and I have struggling a bit too get things done that I had imagined I would. I was only thinking yesterday that I need to sit down and set out a bit of a routine. So thank you for the inspiration I needed. I also do have my daily routines and I have to say that it makes me a better mum and wife. It's because I always know the things to be done and I know that if I stick to my daily plan, I am relaxed when I finished it all. Then there is enough time for me to knit, sew or play with my kids and make my family a lovely, healthy diner. Can't wait to buy your follow-up book! Pam, the ebooks can be sold abroad and locally because I have the copyright and I'm publishing them myself. With the followup print book, that will be under contract to Penguin and therefore only be available for sale in Australia. However, some Australian book shops did very good business with Down to Earth, sending it internationally and I hope that will happen again. Of course, if an international publisher were to offer me a contract for sales outside Australia, I'd probably jump at it. I have daily routines, weekly routines and monthly routines. I also have a menu plan for a month and the main benefit of it all for me is that if I feel unwell (or just plain lazy!) I am still able to get everything done, just by following my plans. Can I just say that pre-sliced apples in a bag is one of the most bizarre things I've ever heard of! It's right up there with ready made mashed potatoes. Who comes up with these things? Is there someone who sits in an office and wonders what is the most onerous and time consuming household chore? "I've got it!! Slicing apples!!" Bit scary really. I saw COOKED rice in a packet in the supermarket the other day!!! You put me to shame! Not too good at organising, so fall down here. Sometimes it all runs along fine, I feel pleased with what I've acheived, other days it just doesn't happen. I must try harder at this. Life would be easier I'm sure in the long run. Thanks Rhonda for another interesting post. Rhonda, your amazing in all that you do!! God Bless dear Hanno - you are a team and with his support you can achieve all you need to! I LOVE your candelabra, just gorgeous! Have a great day. I should have added, though not too organised, I do make most of our food from scratch, just need to get timing for things better. Hello Rhonda. What a great post, and timely for me. I've just gone back to work after having my second child. I am feeling sad that I will have to outsource some things, as I have so loved being at home and having time to get things done. I'd just like to add that I have at times struggled with depression and anxiety. One of the things I found really helped was to alter my routine on a day when I am feeling a bit blah to make sure doing something simple for myself - as you mentioned - makes the rest of the day go so much better. Conversely, my mum always says "trust the process". When I look at the recipe for the dinner and feel I just can't tackle it, I remind myself of that and just do one step at a time. Before you know it I no longer feel overwhelmed by it (yes I am sorry to admit I hate cooking but am an avid make from scratcher anyway!). And one more thing - I always make a list at the END of the day saying what I DID do. Sometimes it's quite different to what I meant to do, but it helps me not feel bad about not doing the mending if I remind myself that instead I pulled weeds or such like. I'm sorry to read of your struggles and it's good you know how to help yourself with them. Your end of the day list is a great strategy. And as I'm your second mum, I'll step in here after your mum's good advice and offer this: If you know you've done your best on any particular day, that's enough. Sometimes your best will be everything you planned to do, sometimes it will just be getting dinner on the table. But if you know in your heart you did your best with the time you had that day, be okay with that. There is no 'perfect'. Hi Rhonda and everyone. What a great post! I am just getting back into a routine after returning from mat leave. I did have a chuckle to myself, however, as I read it while eating a ready made scone. I bought a packet while I was staying at a hostel and there were no cooking facilities. I always make my own scones but oh my these were delicious! Hope I haven't started a new bad habit. So happy to hear about the book. I love routine. I am a creature of habit and I love it. I am teaching my children about routine and timetables as well. I can get so much more accomplished if I make a list and do everything in order. Im loving the theme of this post as I have been thinking a lot about organisation lately, and the need for it in my own home. I work part time 20 hours and have kids at sport most nights. I have takeaway about once a month. I cook from scratch the rest. Proud last night made zucchini fritters, zucchini,corn,spring onion,chili,eggs from my garden. Only added flour and oil to cook. I also make my cleaning products. We go caravaning with kids twice a year, I have oven in van and cooktop. We always cook and I bake whilst we are away. Saves a fortune on coastal prices. We get to go on holidays because I cook all year, my kids are strong healthly children, that eat fresh produce everyday from my garden. My daughter's lunchbox looks different from the rest, no processed rubbish food, home cooked and baked goods. Kids often say can I have some. I LOVED this post! I recently watched an amazing video on youtube called Life (Mostly) Off The Grid, there was a fantastic line in it, stating something along the lines of "It's not a busy life, but it's a full life". This explains exactly how I feel now. This morning, before paid work, I had raked out the chook pen, checked the veggie garden and started sorting out seeds that need to be planted soon. I don't have a routine at the moment, but I think I need to impose one. I'm finding that I'm not spending any time on myself, doing things that I need to do to relax, I haven't finished a book in a month. Thank you for reminding me, that I need to impose some rules on myself. Routines are something I struggle with. There is always something more exciting to do (like comment on your blog instead of dust haha!). Thanks as always for the gentle reminders Rhonda! I have learned how important organization and self-discipline are in my life this past year. In December, 2011, I took on a job that will last until the end of this year. It is not a stressful job, but it involves working nearly 46 hours a week. The opportunity to earn quite a bit of money was a God-send to our family as we try to meet our goal of owning our small farm. At the end of the year, we will be very, very close ot our goal. As a result, I have to be very disciplined and plan our meals and make sure I have my own, home-made convenience foods ready to go. On Sundays, I spend an hour or so in the kitchen and prepare meal-starters such as pre-cooking meat, slicing vegetables, making a big pot of soup, etc. By having these items ready to go, I can put a home-cooked meal on the table instead of driving through a fast-food place. I also make sure that the following things are done before I go to work: beds made, dishes done, a load of laundry ran through the washer, and supper sorted out. I get up a little earlier than the rest of my house so that I have a little time to myself to get things done and gear myself up for the day. These tips aren't revolutionary ideas but they really help my life run more smoothly. I am from the U.S. and ordered your book as soon as it was available. It is now borrowed out for the THIRD time since I bought it. So looking forward to the next one! A book just for me?!?!? Organization and routine! I'm nearing 49 and have never mastered either. I bought the first book and had it shipped to Michigan....sooooo worth the money!!!! It gave me some peace, I exhaled. Now I need organized peace. I love this post. I am constantly tweaking my routines/plans in hopes of finding the "perfect" one to stick to ;) I know that's a pipe dream. But my life is about to change again (stopping work outside of the home) so I am excited to start laying down some new routines to stick to. Hoping I don't fritter this new found time too much, as I have so many plans I want to do. and our world was turned upside down, I've never been able to get back into the swing of things. I guess it was because we just had to take things minute by minute. I just did things whenever I could. But I do miss that wonderful feeling of discipline and accomplishment that comes from sticking to a routine. Now I just feel like one of Brown's cows wandering through my days!! It interests me how different a simple life is for each of us! While my home is my haven, I relish my time outdoors in Nature and spend much of my day walking, taking photos, exploring or crafting on my porch. For me, this time of life is all about enjoying life with few commitments, being spontaneous and doing what I want when I want. I spent over 40 years raising 2 generations of children and really enjoy the ME time I have now. Living large on little is my motto! Good day, Rhonda Jean. I love the idea of an e-book based on Down to Earth. I read a lot from my tablet although I still love the feel of reading a real book. Will this e-book be on the same material covered in your new book? I'll be very interested in getting such an e-book when it comes on the market. Starting dinner is my hard one and we have a lot of oops, there's nothing for dinner moments where I've called my husband to get fish n chips or pizza on his way through or I make macaroni cheese which is easy and a favourite but with my wheat intolerance and trying to avoid processed foods I am trying to dodge even the pasta. Sourdough pasta takes a lot of planning though, as does sourdough pizza. 8 hours souring/rising time. I'm not much good at housework either although it's all improving. I've taken to having a timer with me during the day, especially when I sit down at the computer to check out blogs - time just zips past. When the alarm goes, it's off to do other stuff. The other thing is to identify small slices of time.In 10- 20 minutes here and there, it's amazing what you can accomplish. Great to hear you've been commissioned for a follow up book. With three little kids I find a routine is critical. That said, I don't know whether I could actually describe what I do. Its got to do with my mental check list and the rhythm of the day. I miss the routine when I am out of it (school holidays, for instance). I think it is my routine that keeps me sane and feeling like I can cope. Lately I have been trying to formalise, analyse and rejig what i do to fit in more time for writing work. Trying. I'm so excited to hear you are writing another book! I'm a single mum who works 30hrs a week or so, I like doing days, for example: "Monday is washing, Tuesday is groceries, Wednesday is study, Thursday is consider finances and washing, Friday is fun!, Saturday and Sunday are baking, gardening, and outside jobs. I plan each week's jobs on Sunday night, to fit into what is happening with our little family for the week. Continue to love your posts and how applicable they are to every day life. 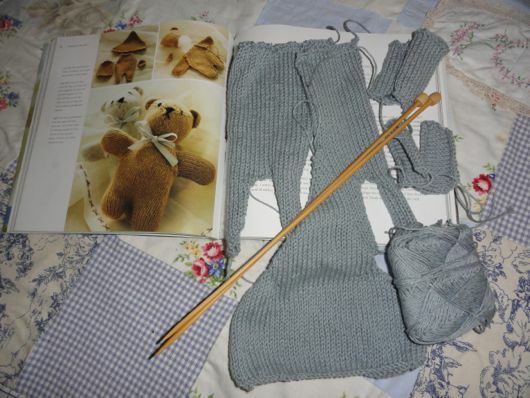 Could you tell me what the name of the book is that has that cute teddy pattern you are knitting? Hello Patricia, the book is Simple Knits for Cherished Babies by Erika Knight. It's my absolute favourite baby knits book. I used a 4 ply organic Japanese cotton for Jamie's. Hi Rondha, I just wanted to let you know how much your blog is useful to me as it gives me ideas and motivation in the life I am trying to live. I do not what many would call a simple life but try to live to similar ethics. I'm 44, have two daughters (19,13)and both my wife and I work full-time. We both love our jobs and have managed to make our family time and time at home significant in many ways. Because of my job, I'm a highschool teacher, I have plenty of time at home -half of the work for my job is done at home- which means I can organise my own schedule according to my priorities. Your book has opened up a whole new world of potentials!!! After tracking down all our spending for about 6 months, we can now write down a manageable monthly budget (using DS Budget) and live on the 80/20 rule. Our house is completely paid for so that helps but with our daughters' studies, that's what we wanted : having finished to pay the mortgage in order to be able to finance the studies. Moreover, we make our own cleaning products now and continue to cook mainly fresh food and cook from scratch. The cooking part is not new for us though as we have both always been taught that way... so this is what I've always seen. 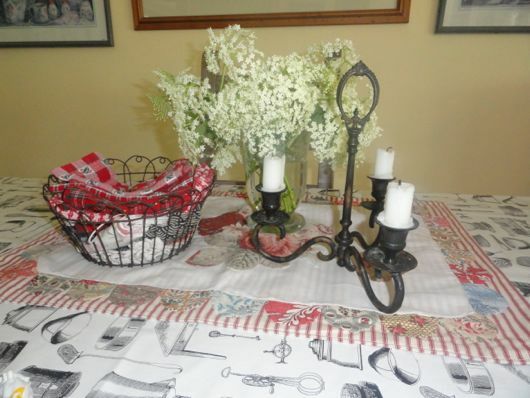 I have a passion for quilting and stitching but also like tending my garden and cooking. So organization is very important. Your post reminded me that again when I read it this morning. I usually, though not always, have a list of things to do. When working in my office at home to prepare the classes for my students, I use the Pomodoro system : work 25mns, break time for 5 mns and so on and after 4 shifts (2 hours) I take a 30-I'm doing until the timer rings. I try not to allow myself to do anything else when the timer is on... that way I can really achieve to finish off many things. This, plus the fact that we have chosen not to have a TV at home, gives us more free time for our family life and our personal passions (quilting and stitching for me and reading and playing the piano for my wife). The same is also true for our two daughters (both musicians too). Though, we are used to living this way, I like to read your blog every day and your book is on my bedside table and I like to read again and again some chapters... it's really motivating. Thank you for all you do. Having the book sent to France has been one of the best investment I made, an investment for a better life. Hi Rhonda, nice to hear that you will be writing again. I too am writing a cheese making eBook, which will be out soon which will contain all the cheeses and recipes that I have made and used since becoming a curd nerd! Here is the link to the cover if anyone is interested, however I am still only half way through the manuscript. I reckon that the more cheese making books the better, because information about home cheese making is hard to find and most hard cover books are quite expensive. What a great post. As a stay at home mum to 2 girls aged 7 and 2, I have to be organised and have routines or things just won't get done. Along with your book, I have read David Gillespie's Sweet Poison and Toxic Oil and have totally transformed how we eat - I am now making most things from scratch so I know what my family is eating. Avoiding sugar and vegetable oil means goodbye processed food (including tomato ketchup!) and making it yourself. I love the concept of returning to pre-World War 2 eating and am enjoying butter again for the first time since my childhood! I am in love with my breadmaker - I need to pack lunches in the morning so want fresh bread ready at 6 am. Ingredients: flour, water, yeast and salt. Couldn't be simpler (recipe is from Sandra Reynolds over at http://120dollarsfoodchallenge.com/). I realise how lucky I am to be able to stay at home when my children are small and I am making the most of it by saving us a fortune on groceries and child care costs. We even have a couple of chooks in a Sydney backyard. Delicious eggs. Your book and blog really started me on my journey to simplify our lives. We still have a long way to go (decluttering is a never-ending journey!) but I feel simple joy in simple pleasures at the moment - between the 2 year old's tantrums of course. All great tips as usual but I still cannot get over how expensive produce is in Australia. 40p for two carrots? My goodness! In the morning, if the weather is going to be hot, I get up early and water the veg garden. It's too big to do it all before the Sun comes over the trees and I have to retreat into the cool house. So I do it in stages, morning and night a couple so days sees it all covered. Then I breakfast, check my emails and get on with a kitchen tidy. At the moment I am making preserves of all my different vegetable and fruit harvest. Today I am putting together some tomato ketchup. I cooked lightly the tomatoes yesterday and put them through the mouli last night. Today I put the rest of the ingrediants together and make it. Musn't forget to get the bottles ready to take the sauce. I will slice some small zucchinis and salt them for some bread and butter pickles. I have some Pinot noir grapes and apple jelly to put on the stove and finish and I want to make some mint sauce too. Lots to keep me going, too much probably, but I'll play it by ear. In between all that I'll have lunch and get dinner on. I don't have any out of the house things to do today, so that's nice. I can stay home and do homely things! My favourite!